Cork born Seamus Cashman is the founder of one of Ireland's leading literary and cultural publishing houses, Wolfhound Press. Previous poetry collections are: Carnival and Clowns & Acrobats. He edited two landmark anthologies for young readers, The Wolfhound Book of Irish Poems for Young People (1975) still in print, and Something Beginning with P: new poems from Irish poets (2004). He is a publishing consultant and writing tutor. He lives in Portmarnock. 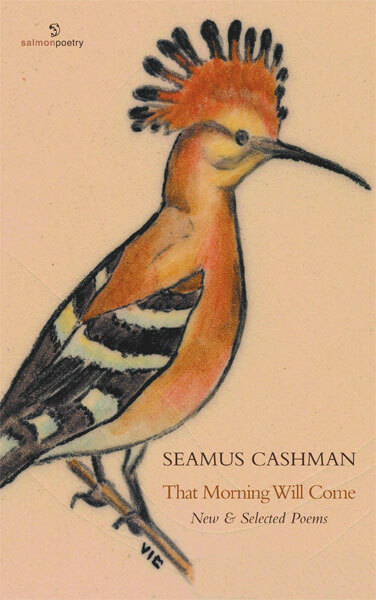 The new poems in this collection reflect Cashman's sense of place and of the spiritual groundings of daily life characteristic of his early poems. Secrets, a sequence of thirteen poems written following a visit to Palestine-such as 'The separation wall', 'Random contact', 'Exceptions to the truth'-are passionate responses to contemporary political tragedy, abuse of human rights, and love of homeland (tÃ­r grá). Poems in section two, Opening Doors, dance between childhood and parenthood, catch glimpses in mirrors and are 'Flying skies'. Here are accessible, confident poems by a poet whose lyrical voice captivates. we share the surprise of stone and water. generosity dries like a stolen well. In sunshine our shadows toll our fields to harvest. So bitter for holy places, we lust for hilltop, valley, river, dream. that we share this floor of shattered glass? Is the melody all peeled from our song? Is the wall too high? Who tears apart our hearts? Who will not hear? Who tears our eyes apart? Who will not see? Who cuts the trunk so branches wither dry? Who drinks the water, hides the sky. As each day dies we wait in darkness for a dawn. And then we bury our dead. The great Irish poet Paddy Kavanagh distinguished between provincial and parochial artists. For former, he said, ignored the homeplace; for instance, the Inishkeen poet writing for the Dublin set. The parochial poet, however, writes for those nearby and so doing t aps into universal themes and feelings. No longer self-consciously shamrocky or, more self-consciously, avoiding everything Irish, such Irish poets as Cashman are parochial and global. Cashman begins his fine new collection in Palestine, another divided and war-weary land, in which people "wait in darkness for a dawn" and "melody [is] all peeled from our song." The poem is remarkably tuned to the tragic beauty of occupied lands, where "negotiation is a song / with its rhythm, rhyme, and wrong" and people love one another despite it all. Elsewhere, he seamlessly links the Irish language and references to Irish traditions to epigrams from Geronimo and classical allusions. In a sure, measured voice, Cashman shows that natural beauty and family affection are the same in Jerusalem and Portmarnock. Have just about recovered from US trip which included a poetry reading journey that took me across the billowy landscapes of the state of Iowa. Instigated and organised by the Poet Laureate of Iowa, Mary Swander, I was travelling with poet Joan McBreen whose husband Joe did all the driving, much to my relief. I had just spend four days at the annual gathering of Fellows of The Black Earth Institute in Wisconsin, debating and sharing aspects of poetry and the arts in relation to spirituality, the environment and social justice. A ‘progressive’ artists and scholars think-tank, Black Earth Institute has been an all too brief haven of inspiration, learning and discussion in September in each of the past three years. We swandered our way across the state, beginning by the Loess Hills at Omaha's Uni. of Nebraska, just west of the Missouri river, hosted of Professor John Price (author of the award-winning memoir, Man killed by pheasant) with lunchtime and evening readings, and dinner at The Brazen Head! Then, back into Iowa for reading and discussion sessions at Ames State Uni (bodhráned into a working lunch by the Poet Laureate herself), to Ames High School for two packed and exciting sessions, and to Des Moines, the state capital – for an evening 'Erin Fest' of readings in the elegance of the State Governor's Mansion to the strains of an Irish harp and graced by two superb young local dancers, and where poets are welcomed by the state’s Lt Governor, Patty Judge, and introduced by the Poet Laureate. Next morning it was back roads to Northern Iowa Uni. in Cedar Falls for a mid-day reading and question-time, and thence south to the famed Prairie Lights Bookstore in Iowa City. Here we read under the auspices of its world famous International Writers Program (Iowa City is a UNESCO designated ‘City of Literature’, as just recently is Dublin). There we read to, and met with poets in residence from Palestine (see below), Djibouti, Iceland, Venezuela, Germany, Goa, Albania and many other countries – this was a highlight of the tour, and drew a full house. Our final stop on the tour was the lovely city of Dubuque in Iowa, about the size of Galway, on the banks of the Mississippi and set amid forested hilly drumlin-like surrounds. A very different Iowan landscape. We read here at the University of Dubuque, and in Loras college, both small private colleges, one hosted by the poet-in-residence Lauren Allyene from Trinidad who enjoys the emerald green of Ireland and its literature; the other hosted by Andrew Auge, a scholar who has written extensively on contemporary Irish poetry. Both events had very full houses of graduates & students, staff and some general public - as indeed had earlier venues. By that night, Joan and I had completed nine readings and I had also done a one-hour interview on a popular Iowa public radio talk show – introduced as a poet but questioned on human rights in Ireland, on Palestine, and on the state of Irish economy; I managed to get the space to close with a poem! Next morning I returned to Ireland, Joan and Joe continued the reading circuit for another couple of weeks in colleges and states further south. "Poetry International runs this year from Saturday 30 October – 7 November, and has a strong focus on poets and poetry from the Middle East and Palestine. Our opening night event features four poets from the region/diaspora - Nouri al-Jarrah, Fady Joudah, Hyam Jared and Najwan Darwish – who are each inviting a UK/Irish poet that they’d like to read with. Najwan Darwish would like to read with you, and I’m hoping that you’ll be available to join us. The event is on Saturday 30 October at 7.45pm in Purcell Room." So, All Thanks and All Hail to that great Iowa Poet Laureate, Mary Swander! (www.maryswander.com). She has introduced me to the extraordinary hospitality and generosity, and the welcoming and questioning interest of American poetry reading audiences.